This is certainly a fair question, but I think without being too self-serving that there are legitimate answers. For one thing, reef fish on average in a successful reef tank live much longer that those on the natural reef – predation by larger fish, especially reef sharks, take a huge number in the wild. For another, competition for food and space is usually less severe in captivity. Far more important than these answers relates to the question of our time: survival of life on our planet. It is the folks that struggle to successfully establish a reef tank, or to teach fledgling Whopping Cranes to fly, or to save Polar Bears from starving due to global warming, who because of their intimate contact with these and other animals are among those that care. If you don’t love the animals that inhabit your reef tank, and understand the biochemical elements that are necessary to maintain a successful reef tank then it is unlikely that you will be a successful reef keeper. For example, reef keepers know what it means to a maintain a good carbonate balance, and therefore understand what scientists worry about when talking about the acidification of the world’s oceans. From ones reef tank it is an easy step to recognizing the beauty and complexity and fragility of a natural reef. And more importantly, to want to fight for the survival of Nature, in all of itsmanifestations. 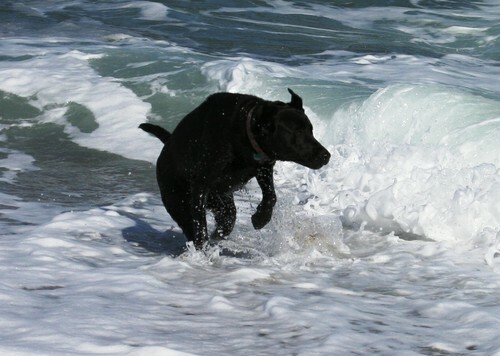 My dog Smudge, a black female Lab rescue, having fun in the surf at Cape Cod. Though I doubt if such a poll was ever taken, I’m willing to bet that if you polled reef keepers, dog and cat owners, etc. compared to folks that haven’t made animals part of their lives you would find a much higher desire to fight for the survival of Earth’s animal diversity amongst these biophiles. Biophiles are folks who have an affection for nature, as opposed to necrophiles, who prefer dead things like toasters or televisions, etc. One is much more likely to fight for Nature’s survival if you have intimate contact with Nature. Create a thriving reef tank or spend some time in scuba gear observing a tropical reef and you are likely to care about and fight for what remains of the wild coral reefs of the world.